A lot has been going on. Spring comes and goes so quickly that it can be hard to live in the moment, and the crush of the season has been made doubly busy by the steady stream of lab work, nursery and greenhouse duties and other daily chores. Throw in a couple of extended field trips and before you know it your blog is in serious need of updating. With so much going on, it's hard to pick where to start. 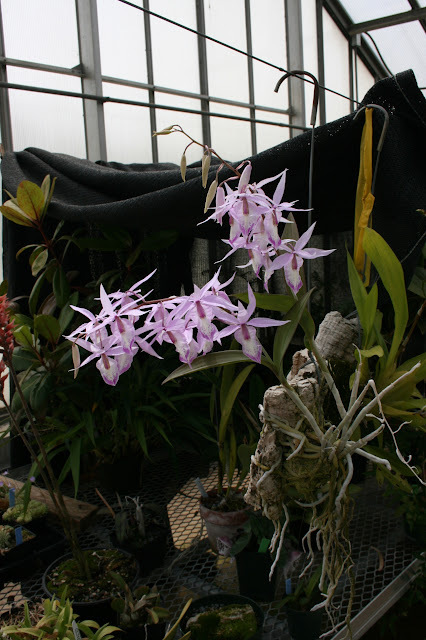 A plant that I have grow for several years, but never flowered in Cattleya aclandiae. This year, two of my plants are flowering. This species is considered difficult to grow, but 5 seedlings have grown quickly for me mounted directly on an oak log, making one of the most impressive specimens in my collection. The plants are directly on the log, no sphagnum moss has been added and I think the plants benefit from drying out completely between waterings in the winter. The flowers of C. aclandiae have a distinct fragrance. On the second day after they open, the flowers are strongly scented of old fashioned tea roses. From the third day one, they smell, at least to me, like Pepto Bismal. Overall the fragrance in intense, but pleasing. The flowers remain in good shape for over a month. A consistent April-May bloomer is Sacoila lanceolata. 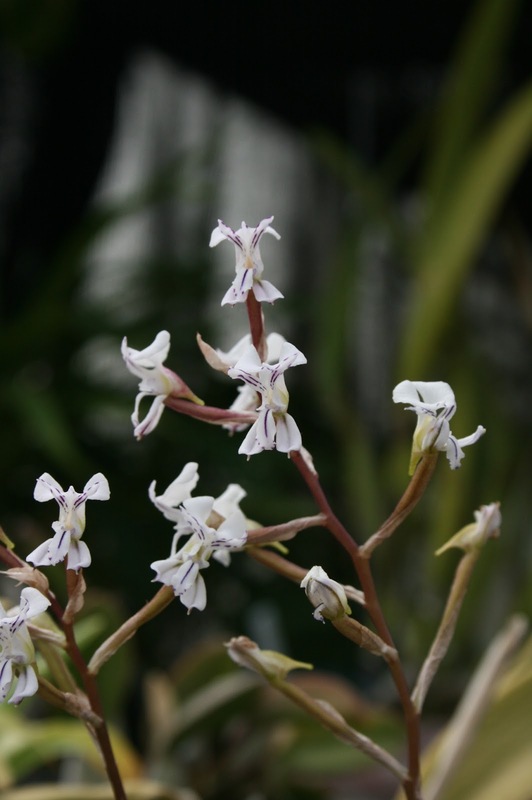 This U.S. native species can still be found along roadsides in peninsular Florida. The foliage emerges soon after flowering finishes. Disa sagittalis is one of the dry-growing South African species. Unlike the more popular and showy Disa uniflora and it's relatives, this species has a pronounced summer dormancy period. 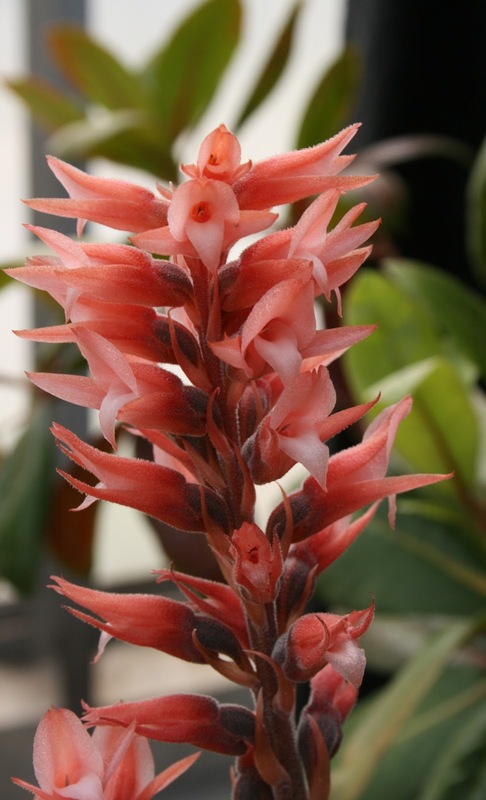 The flowers of D. sagittalis require close inspection and are reminiscent of flowers in the African species of Haworthia. Barkeria spectabilis is a fantastic and easy to grow orchid with very long-lasting flowers. The extra-log roots are an added attraction. This stunning member of the Ericaceae is Agapetes x 'Ludgvan Cross'. This hybrid between Agapetes serpens and A. rugosa grows well in the same condition as my tropical orchids and Vireya rhododendrons. The dangling flowers remind me of exotically colored tropical fish hanging on a a line.